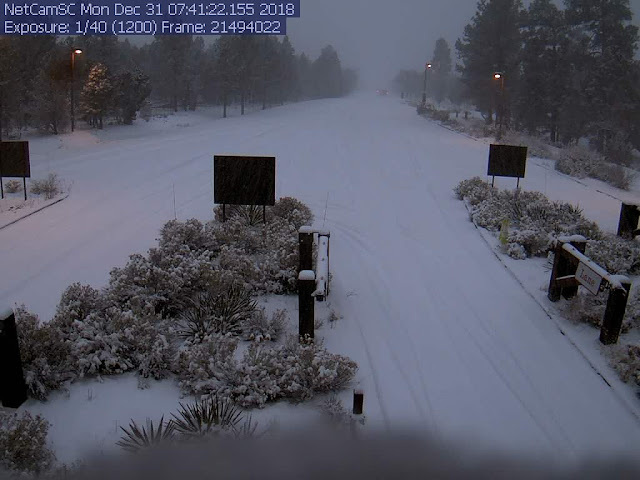 Photo above from south entrance to Grand Canyon National Park, where moderate snow has already been reported this morning. The 500 mb analysis from NCAR (below) shows that the strong, short wave is over the Great Basin, oriented from west-southwest to east-northeast. 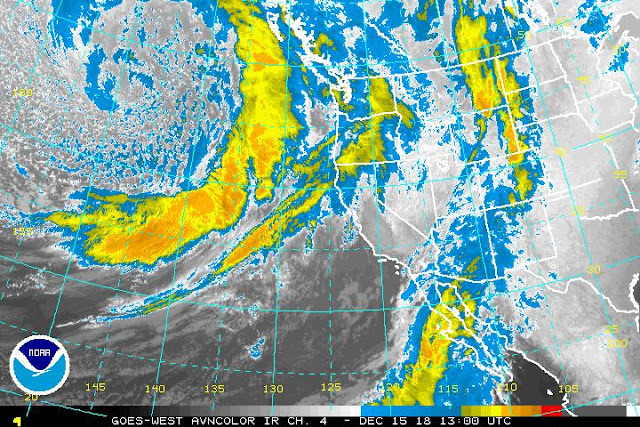 The closed low part of the system will move across northern Arizona tonight and tomorrow, while southern portion of wave swings across southern Arizona. Note that core of system is very cold, with temperatures around - 36 C.
This is another storm with limited moisture, as per 06 UTC GEFS plumes for PW at TUS above. Models forecast a much deeper intrusion of moisture from low latitudes next weekend. The plumes for QPF at Tucson (below) average just less than half an inch. The 06 UTC WRF-GFS forecasts an amount of 0.70", while this morning's 12 UTC WRF-RR forecasts only 0.20". Snow accumulations will occur very close to our east and southeast, still with some chances of a few flakes mixed in over parts of the metro area. The WRF forecasts continue to indicate strong winds of 20 to 30 mph ahead of the cold front this afternoon and evening. Data from Mt. Hopkins are now available - the RAWS site there had maximum gusts of 56 mph at 2:00 am MST yesterday morning. 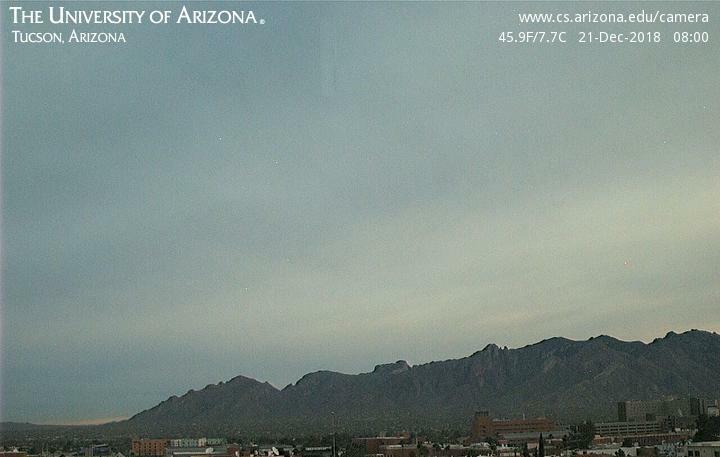 First, cold and snow yesterday morning - two views of higher foothills of Catalinas with first visible snow of winter. Above is from my later-than usual morning walk, and view below from the Ferner's looking across our circle. Temperatures were very cold with the low here dropping to 23 F (currently 24 F this morning) - there was moderate frost and ice on the puddles when I walked. Above is this morning's 500 mb analysis from NCAR. The very cold, closed low over northwest Sonora is probably causing many temperature problems for so far south and likely snows in the mountains. Below is this morning's NAM forecast of the 500 mb level valid at 5:00 pm MST tomorrow evening. 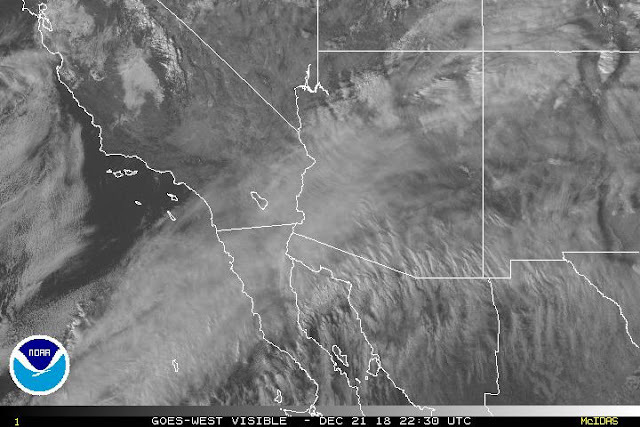 The strong short wave currently over the Northwest digs southward, into the long-wave trough that has persisted for a number of days over the west-central U.S., and is entering northwestern Arizona. The 06 UTC QPF plumes for the airport from GEFS (above) are very similar to the last two events, forecasting amounts at airport of 0.30" to 0.40" during the night tomorrow. The GEFS actually has 20% to 30 % chances for some snow mixed with the rain by morning on New Years. The forecast below of snowfall through 5:00 am on 1st is from the 06 UTC run of the WRF-GFS at Atmo. If forecast were to verify, road conditions late New Years night would become very dicey on Highway 83 south of I-10 - same for Texas Canyon on I-10 east of Benson. Finally, a bit about the winds. I wasn't paying close attention to WRF forecasts and Mt. Hopkins is apparently have a 50 - 60 mph high wind event event this morning, although RAWS observations are missing since midnight last night. As the shortwave approaches tomorrow afternoon winds from the southwest become quite strong over southeastern Arizona. The forecast below is valid at 5:00 pm tomorrow afternoon. If you're going to be out and about New Year's eve, take care. 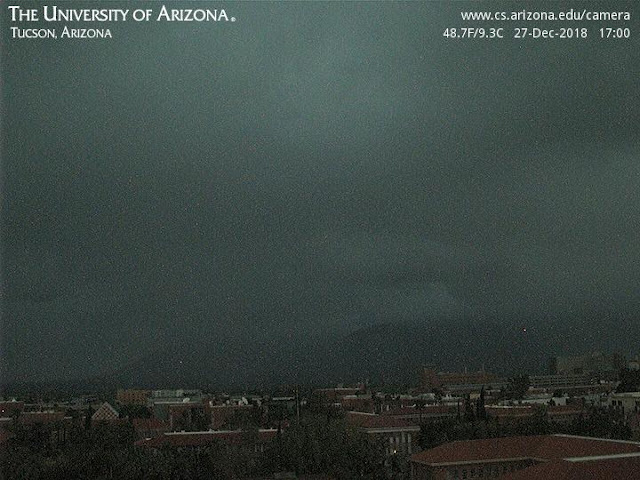 Very thick clouds and light rain at 5:00 pm MST yesterday afternoon - light showers began here at house around 3:30 pm. The two webcam views from the General Store in Summerhaven below are from 5:00 pm last evening and at 5:00 am this morning. Looks like around four inches of new snow up there on the mountain. The ALERT observations this morning from 5:30 am, for past day, indicate this widespread event was a bit wetter than the preceding one this week. There were 7 sites with over half an inch yesterday. Here in the metro the precipitation had generally ended by 11:00 pm, so this event was mostly on the 27th. Little thunderstorm activity with this event - CG flashes were detected in Pima County, but mainly far out at it's west edge. Here at house we had 0.30"; TUS had 0.32"; DM measured .32": and Atmo recorded 0.24". December now stands at a bit over an inch. The next digging short wave at 500 mb may bring another quick round of showers late on 31st and the first day of 2019. December has certainly been much different than November here. 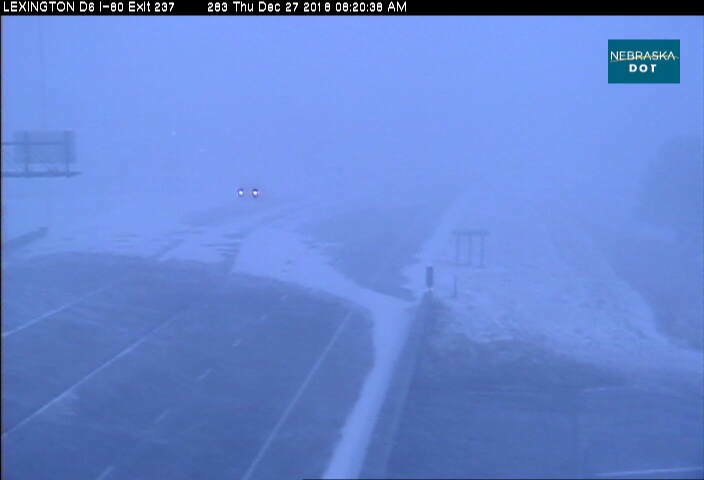 First short wave from 36-hours ago is producing blizzard conditions over parts of Northern/Central Plains - above is webcam from Lexington, Nebraska. This morning's 500 mb analysis from SPC (below) indicates the next short wave is currently over the Northwest - from Idaho southward across Nevada. The 06 UTC GEFS plumes forecast this low-moisture system will pass quickly by tonight - forecast for PW above spikes at a bit less than half an inch, while QPF forecast for TUS (below) has average of less than 0.20" - forecasts similar to last event. The 06 UTC run of the WRF-GFS at Atmo forecasts a period of gusty southwest winds this evening - forecast at bottom valid at 8:00 pm MST later today. Peaceful snow scene before sunrise at the Summerhaven General Store - looks like several inches up there. Another widespread event, but with light precipitation amounts - generally around 0.20" to 0.30". ALERT observations (above and below) are for 24-hours ending at 6:30 am MST this morning. The airport had 0.26"; Atmo had 0.23"; here at house we got 0.21"; and DM measured 0.20". The airport had gusty winds to around 40 mph ahead of front and then reported thunder in one observation. Precipitation occurred before and after midnight, spanning both the 25th and 26th. Timing and amounts for GEFS average (post yesterday) were quite good for our area. The plot of detected CG flashes (at bottom) shows thunderstorms occurred over much of Pima County - there was a small cluster of flashes south of airport that is hard to see on the plots. No thunder here. A trailing system from the north will come through during early hours of 28 December (Friday). While there will be precipitation again, it appears that this second system may be even more moisture-starved than the one that has just passed. I have been offline a few days while son Jason visited - he is flying home this am and is currently at LAX, before heading east for DIA. 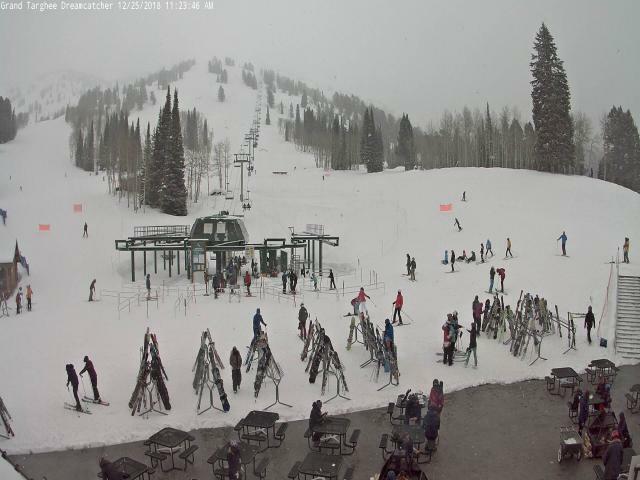 Above shows Grand Targhee, Wyoming, with Christmas skiers at about 11:30 am MST. This location is west of Jackson near the Idaho border. 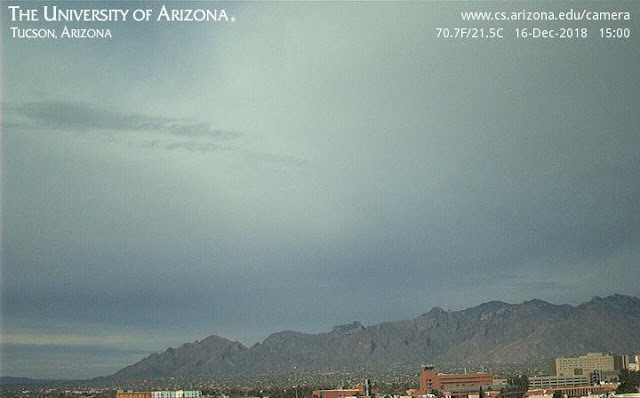 For us, there'll be a fast-moving storm system crossing southern Arizona this afternoon and tonight, as we start an unsettled amd much cooler final week of 2018. This morning's 12 UTC GEFS plumes for QPF at Tucson (above) forecast a basically nighttime event here - the QPF values range from about 0.10" to 0.44" at the airport. A following short wave produces another event for the 28th, and then uncertainty sets in among the GEFS members for rest of year. The WRF model forecasts for the airport have been jumping around quite a bit. The forecast for total precipitation below is from this morning's 12 UTC WRF-NAM - this model forecasts a Trace at airport. The 06 UTC runs had the NAM version also with just a Trace, while the GFS version forecast 0.20". At the bottom is the 12 UTC WRF-NAM forecast skew-T for TWC valid at 9:00 pm early tonight. There is certainly enough CAPE in the sounding to support winter thunderstorms. Will watch and wait. To all who would happen to drop-in here today - hope you have a great Holiday. December 21st has been a dreary, quite cloudy day - very much more clouds and cooler temperatures than forecast by NWS this morning. 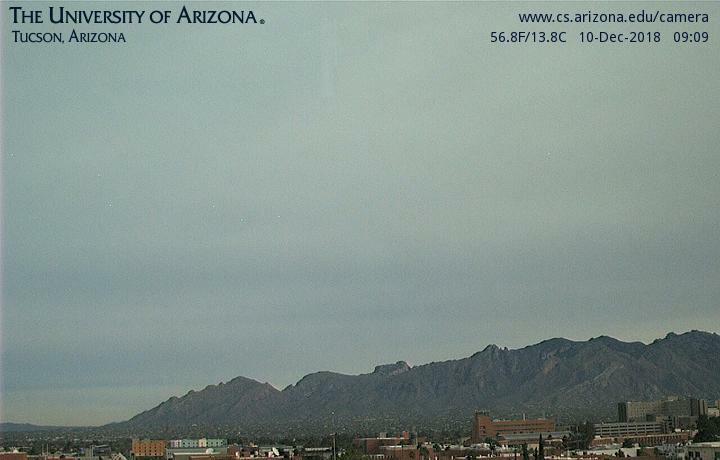 View from campus at 8:00 am MST and 4:00 pm, above and below, show the high cloudiness that has prevailed through the day. 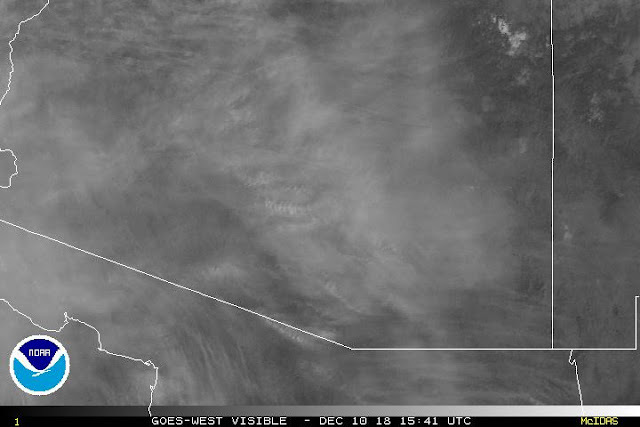 Second below is visible satellite image from 3:30 pm. Even though the NWS ASOS observations indicate that it has been clear all day, the incoming solar radiation plot from Atmo above shows the very large differences in direct incoming radiation (green) for today versus yesterday, when it actually was clear. Last evening's WRF-GFS forecast the cloudiness and radiation for today quite well. This morning's 12 UTC WRF-GFS precipitation forecast through 10:00 am on the 28th is below, with southeast Arizona forecast to have a fair amount of precipitation during that period. Showers occur in the model's forecast late on Christmas day and again early on the 28th. So hopefully a bit more rain in the gauge before the start of 2019. 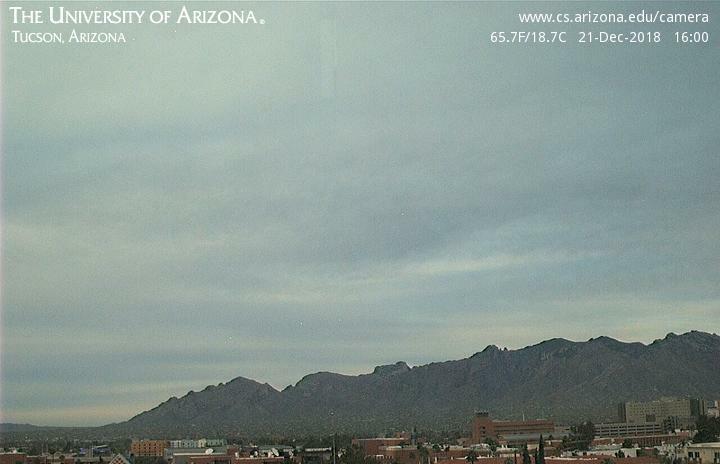 Have just looked at campus webcam images for past week - most of week was similar to above from 3:00 pm MST yesterday - cloudy to mostly cloudy. There were two days mid-week that were sunny to partly sunny. Of interest is that light showers occurred across parts of metro after dark last evening - just a sprinkle here with a Trace, and no reports of 0.04" in the ALERT network. The GEFS forecasts for Christmas Eve at 5:00 pm continue to have a large spread - I picked out 4 interesting members (500 mb above and surface with precipitation below). Some members of the ensemble forecast a closed 500 mb low somewhere over the Southwest/northwest Mexico. At the same time 2 of the members forecast precipitation over southeast Arizona at that time. The operational ECWF for same time is not much like any of GEFS forecasts. This is mainly because the European model is slower and forecasts a strong, closed low over our area after 192-hours. 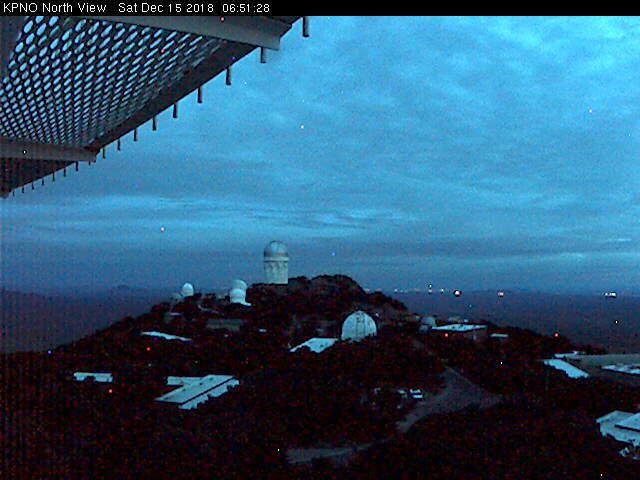 Another day begins with widespread cloudiness - as per Kitt Peak view to north at 6:51 am MST this morning. The IR satellite image below is from 13 UTC (6:00 am local) - note the wide plume of clouds from subtropics that covers most of Arizona. We reached mid-month with only one precipitation event, and there's little on the horizon for the Southwest. Graphic above shows total precipitation forecast from the 00 UTC WRF-GFS on 5.4 km grid for period ending at 5:00 pm on December 22nd. The East continues to have the corner on the big storm market, as an unusually warm system moves northeastward from Tennessee - surface plot below (from NCAR) shows rain from Florida northward past D.C.. Temperatures are above freezing from Florida to New York, which I think is fairly rare for this time of year. First - cold morning here at house with low of 25 F - some moderate frost around, and first morning of Fall/Winter with temperatures here in north part of the city down in the 20s. Both the airport and DM came in with lows of only 35 F, but nearby RAWS sites were cold also - Empire was 25 F and Sasabe was 21 F.
Looking far ahead, graphic above shows GEFS mean 500 mb and spaghetti plot out at 276-hours, which is 12 UTC Christmas morning. Mean keeps strong trough in east and ridge off west coast. Of course at that long range, there is also a huge helping of spaghetti on the plate. 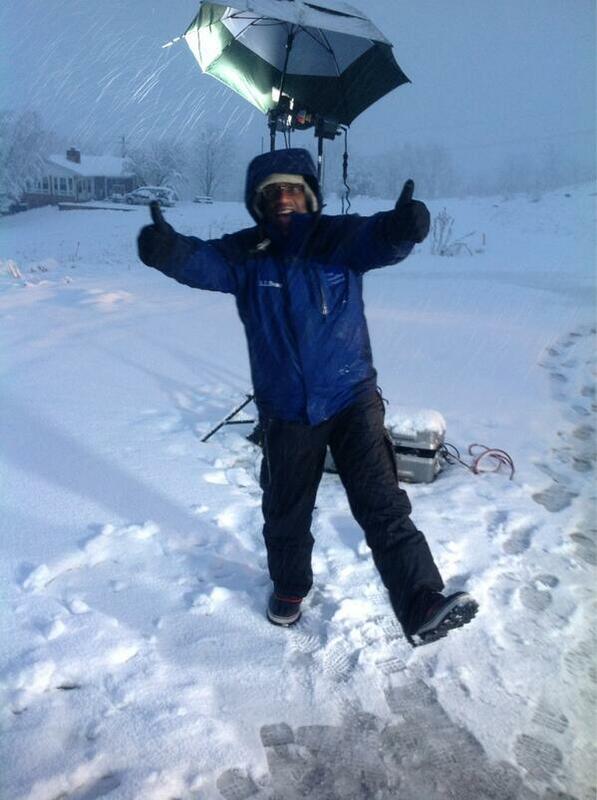 This morning Al Roker is celebrating 40 years of doing the weather-cast on NBC - so kudos to Al! Visible image above from a bit before 9:00 am MST shows the high overcast that covers southern Arizona this morning (as per view north from campus a bit after 9:00 am at bottom). Before the clouds moved in, the temperature here dropped to 34 F and cold air along Rillito is keeping the easterly winds that have been observed at airport aloft in this part of city. Low yesterday was 36 F and on both mornings there was light frost on grassy areas at the park down right by the wash.
Our first precipitation event of December occurred on both the 6th and 7th, with two episodes about 12-hours apart. The ALERT maps here cover the entire event. Looks like total amounts about equally split above and below half an inch, with max amounts around three quarters of an inch. Considerable lightning and thunder occurred during both episodes, but was much more widespread in the second, heavier episode yesterday. Map second below covers entire event and shows CG flash density (from weather.graphics and Vaisala). The airport had 0.72", considerably exceeding yesterday's model forecasts - including all the GEFS plumes. Here at house the total was 0.58" - nice event to start December with amounts more than November's one event by more than two. The long-range is fairly uncertain - a weak system passes by around December 12th, with little precipitation forecast to accompany it. By 240-hours (5:00 pm MST on December 17th) there is a very large difference between the operational GFS (above) and ECMWF (below) forecasts. last time I did a long-range comparison the average of the two models was closest to observations - this time?